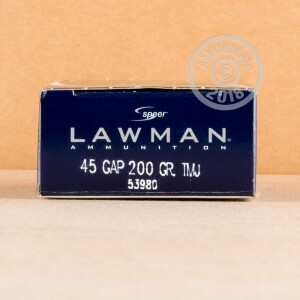 This 45 GAP cartridge from Speer’s Lawman line of ammunition sports a 200 grain projectile, the maximum bullet weight that its caliber was originally introduced with. Because this bullet is totally encapsulated by its total metal jacket, its core is protected against evaporation by hot propellant gasses while firing. The result is a round that is substantially safer to fire in poorly ventilated indoor ranges, as with it you’ll breathe in far fewer trace toxic fumes. This round approximates the performance of a personal defense load as well as well as possible, so training with it will give you a realistic feel for how your self-defense weapon will operate should you ever have to rely on it. It boasts a 990 fps muzzle velocity, as well as a non-corrosive Boxer primer and factory fresh brass casing. 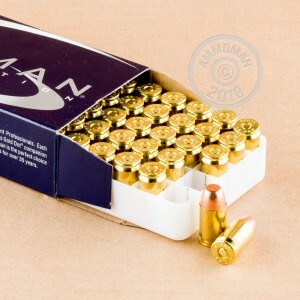 It is wholly appropriate for reloading, so the clever handloader can keep these 1,000 rounds active for several trips to the range.